PM K P Sharma Oli to expand Cabinet - Integration Through Media ....! 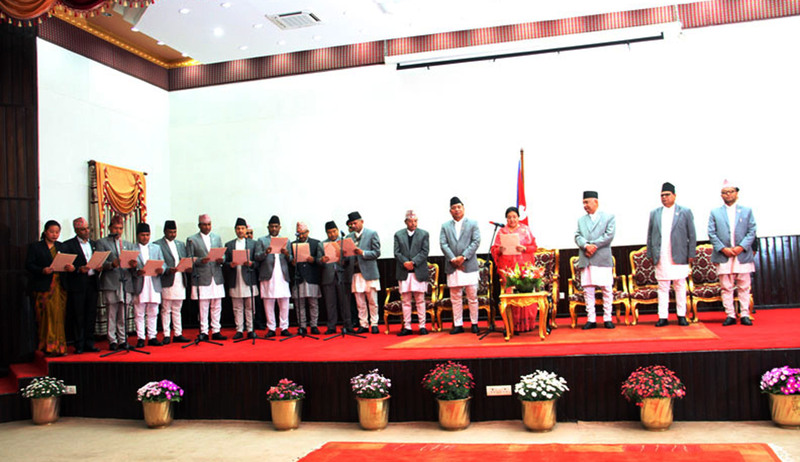 KATHMANDU: Prime Minister K P Sharma Oli is all set to expand his Cabinet today and induct new ministers in an attempt to give shape to his Council of Ministers. Chief political advisor to the Prime Minister, Bishnu Rimal said that the remaining ministers would be appointed today. The Office of the President has scheduled the time for administering the oath of office and secrecy to the newly-appointed ministers at 4 pm today. The Cabinet is to be expanded by including the political parties backing the government. New ministers would be picked from the CPN (UML), the CPN (Maoist Centre) and the Federal Socialist Forum Nepal. PM Oli had held consultation with Maoist Centre Chair Pushpa Kamal Dahal ‘Prachanda’ on Thursday regarding Cabinet expansion. Oli was appointed the Prime Minister on February 15 and the Cabinet was expanded for the first time the same day and for second time on February 26. The government is preparing to increase the number of ministries to 21 with the Forum’s joining the incumbent government.